My voice has been silenced in the last twenty-four hours. Literally. Sickness has claimed my vocal cords. This has never happened to me before, not completely in the way it has happened for me this time around. My whispered shouts for the attention of others are met only by their silence. Not because they don’t care about me, but rather because they can’t hear me. Their listening isn’t prone to my whispering, so mostly… I’m ignored. Probably a relief to most of those in my household, but to a woman who’s used to being heard… a great frustration indeed. About my voice. About my words. About needing to be heard. About what I will say when I am, again, able to say. About quietness. About the value of forced silence. About going inward with my thoughts instead of outwardly displaying every single one of them. About God. About his voice. About his needing to be heard. About his willingness to keep company with silence… with his thoughts, instead of outwardly displaying every single one of them. About how very connected I feel to Him in all of this. About how my inability to speak amplifies the volume of God’s witness. How many times has the Father whispered my name in the midst of my chaos, only to be ignored because of the noise surrounding my life? My hearing isn’t prone to his whispering. But in silence—in this period of fewer, personal words—I more clearly hear the phrases from heaven. 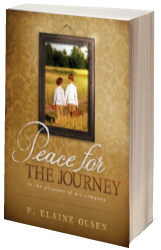 Beautiful, peace-filled, stilled expressions of understanding from God’s heart. My ninth grade English teacher once wrote in my yearbook, “Elaine, if silence is golden you can forget it.” Apparently, I was destined for poverty. Thirty years ago, I hadn’t a clue what she’d meant, and I couldn’t have cared less. Today, I have a clue. Today I care more, exceedingly more. Today, silence really is golden, because silence has given me access to the whispers of home. And whenever that happens, friends, I’m the richest person alive. I’m relieved that I don’t have to make something out of Christmas. lter the truth of its glorious revelation. Bethlehem was and is and will always be God’s moment birthed God’s way. The best I can do, the best we can do, is to do our level best at reflecting upon God’s moment in a way that honors the birthday of the King. All of us approach the manger with personal perspective. The baggage you carry with you is uniquely yours. The memories, the life experiences, the traditions, the sacred shaping of your yesterdays, all collectively gather together as luggage within your mind and heart as you make pilgrimage to Bethlehem this year. Not all of us will celebrate in the same way, but all of us will have the opportunity to do so. To come to the manger and to rejoice, again, over the arrival of Jesus Christ in our lives. Bethlehem belongs to us every bit as much as it belonged to the original participants some 2000 years ago. Are we really so unlike Mother Mary? Haven’t I, haven’t you been given the same news and responsibility that she was given? No matter the week in front of you, no matter the checklists that are burdening you, fear not! He who is conceived in you… remains. He travels these days with you and only asks that, every now and again, you take a few minutes to pause, to pray, and to ponder the glorious truth of his companionship. God is not threatened by your need for celebration—by your tree, your gift-giving, your programs, and your parties. God is with you. God is with me. This is the joy of Bethlehem. I had a thought a couple of days ago when first reading these words from God’s heart via the pen of the Prophet Isaiah. Several thoughts really, but one overriding theme that keeps skipping around in my mind, trying desperately to shelve itself alongside other holy truths that have come home to roost in my heart. A thought that I could, perhaps, one day use in conversation with others when trying to explain to them the gift of Bethlehem—the incarnation of God. Have you tried that lately? Tried to explain to anyone in this season of Advent the reason of Advent? Are you, like me, so tangled up in ribbons and bows and undone lists that you’ve neglected your responsibility to be a baptizer like John—a heralder to the coming Kingdom? When was the last time you doused a soul with the life-giving, Living Water that courses through your veins as truth? In the midst of purchases and planning for the perfect Christmas, what plans have you made for the giving of Jesus Christ? The purchase has already been made… gift-wrapped and hung on a tree nearly 2000 years ago. There is no excuse we can offer for missing it, for missing Him. Even more so for giving Him to others. None. In giving us Jesus Christ, God leveled the playing field for all mankind to enter into a loving, intimate, eternal, and knowing relationship with him. all were made level to make entrance for the King. With Jesus comes stability. With Jesus comes clear and certain revelation. When Jesus points his compass in our direction and makes pilgrimage toward our hearts, there is no obstacle in our past or present that can prevent his arrival. None. The only obstacle that stands in the way of our receiving God’s truth is our stubborn pride—our ridiculous need to be in charge of our own hearts, our own determinations about our tomorrows which, in the end, will lead us straight to the threshold of hell rather than the gain of heaven. God didn’t create the obstacles that block our path to freedom, readers. There is level ground beneath the feet of Jesus. His way is straight, his steps determined, and there is nothing that will prevent him from making pilgrimage to the front door of our hearts. Advent. The coming of Christ, the Child. The redemption of Christ, the Savior. The forever with Christ, the Lord! The glory of the Lord has been revealed. It’s time for all the world to see it. My dad is the funniest man I know. Not the stand-up comedic kind of funny, but the everyday conversation kind of funny. As the man walketh, so does his humor. Those of you who know him well, know this to be true. Those of you who know me well, know this also to be true of me. I know this shocks some of you. I’ve even heard it from some of you upon meeting me for the first time. Elaine, I thought you’d be this serious, contemplative type of person who sits around all day thinking profound thoughts about God. Instead, you’re funny. I’ve never been offended by the conclusion. After all, I write about some fairly heavy stuff here at “peace for the journey.” But I like knowing that I can be both—contemplative and humorous. I have my father to thank for this genetic DNA. My daddy makes me think and makes me laugh, sometimes within the span of a few minutes. He’s the most generous man I know, giving the best of himself away to all who cross his path. He’s not impressed with things, more importantly, not impressed with himself. He is, however, impressed by the story. Your story; my story; God’s story. My daddy sees God everywhere, because my daddy is connected to life. To joys and pains equally. To highs and lows. Griefs and graces. Sorrows and celebrations. Regardless of the occasion, my dad has discovered how to live with a balanced perspective. My father lives contentedly and always tempers the tough times with large doses of humor. I’m so glad I still have him around. He was the first man to ever hold me, to ever love me. The first man to wipe my tears, to tell me bedtime stories, to pray the prayers that all good parents should be praying with their children. He was the only man who loved me when others would not … could not. And his were the arms that stretched wide-open for me and welcomed me home after a long season of loveless wandering in the wilderness. In doing so, my daddy told me the story of Jesus all over again. That one moment in my personal history did more to script the eternal witness of God into my life than any other. And so, today, I tell you again this story I’ve told you before via this video that I posted on my one-year blogging anniversary, nearly three years ago. It’s a bit painful for me to watch it, considering the many miles that have been walked in the time since first posting it. But one thing, one thread remains the same to this day. My daddy is still stretching his arms wide-open to welcome me home. He’s still making me laugh, still telling me stories. Still connected to the world, and still making sure that I know the way back to Jesus. Today, I honor my father by sharing this witness again. He’d want you to know that, even if you’ve never had an earthly daddy to love you, you have a heavenly Father who loves you perfectly and whose arms are stretched wide on your behalf. I love you, daddy, for so many reasons, but none more so than for telling me … showing me God. You tell him well!